With present-day gadgets serving multi-utility, you no more need to stock different types of equipment for different needs. Gone are the days when you would need a separate DVD player to enjoy your favorite videos as present-day PCs, Chromecast as well as gaming consoles can solve the purpose. So if you are a gaming enthusiast and have got Xbox One or 360, you can use it as an Xbox 360 HD DVD player as well. Moreover, in absence of Xbox media remote, the regular gamepad of the device can be used to control the video playback. The following part discusses in detail on how to play DVD on Xbox One and other models. Does Xbox one play DVDs? So now when you know that it does, the next step is to know howtos. In order to play DVD and Blu-ray disc using your Xbox devices, you need to install a separate Blu-ray player app. You can install the app on the Xbox home or by inserting the disc. While you insert the disc into the gaming console ensure that the disc art is upward facing in relation to the device. Step 1: Take the desired DVD disc that you want to play and insert it into the gaming console. The Microsoft Store will automatically start downloading the relevant app. You can also click the tile that looks like the disc icon on the dashboard. 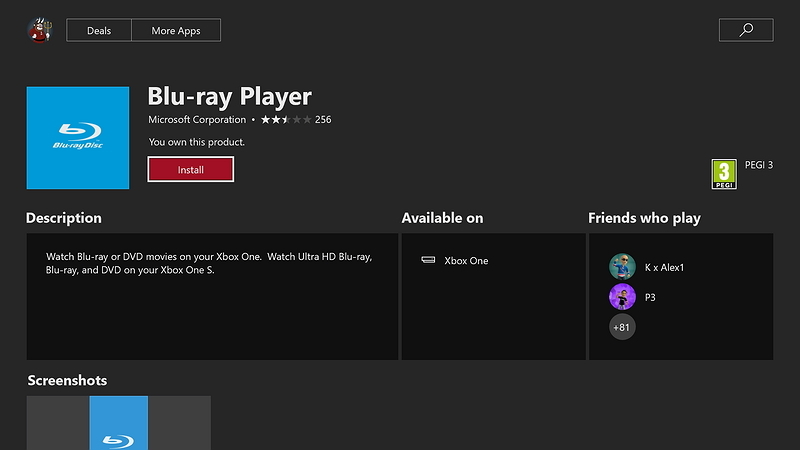 Step 2: Microsoft Store will open with the Blu-ray player app. Click Install to proceed with the process. Step 3: After the app is successfully launched, return to the main dashboard and then launch your video. Step 4: To open the guide, click the Xbox button on the controller. Click Home to move to the home. The Blu-ray player app can be opened from the list of recent apps in the guide; Alternatively, you can also click the disc icon to launch the DVD. The installation of Blu-ray player app converts your gaming console into Xbox DVD player, but this method comes with its share of limitations. 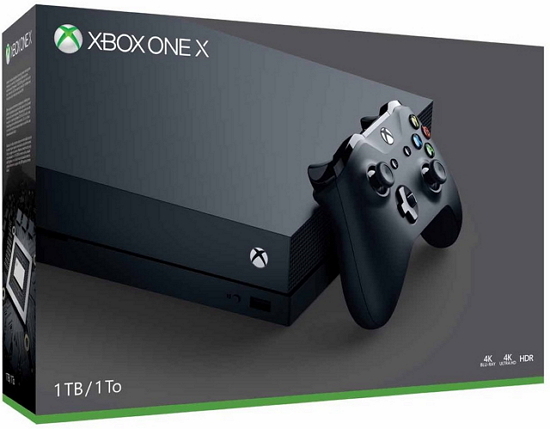 Each unit of Xbox One gaming console is manufactured for specific DVD and Blu-ray region that follows international standards. Thus the consoles are capable of playing only the discs which are sold in the same region as Xbox devices. In case if the discs are designed for all regions, or are not region encoded they can be played on the consoles. To know more about the supported region and related details, visit https://support.Xbox.com/en-CA/Xbox-one/apps/watch-bluray-DVD-movies. So now if we answer the query- can Xbox one play DVDs with this limitation in mind, the answer will be- Yes, but with restriction to supported regions and disc formats. If you want to avoid any limitations with respect to supported discs, and regions while playing your DVDs on Xbox One 360 model, the best solution is to convert the disc to the console supported format. There are a number of converter programs available and one professional name in the list is Wondershare UniConverter (originally Wondershare Video Converter Ultimate). This excellent software ensures that you get quality output in quick simple steps. The program supports more than 1000 formats to get the desired video and audio types including MOV, MKV, FLV, AIFF, M4A, and others. Additionally, you can also select device-specific formats including Xbox, PS3, PS4, iPhone, iPad, and others to rule out any compatibility issues. The conversion process using Wondershare program is super fast and ensures lossless quality. Multiple files can be processed in batches and the built-in video editor also allows customizing files if needed. UniConverter (originally Wondershare Video Converter Ultimate) works on all major OS versions of Windows and Mac system. Insert the desired DVD into your PC before proceeding with the following steps. Step 1 Launch Xbox 360 DVD player software and load DVD videos. 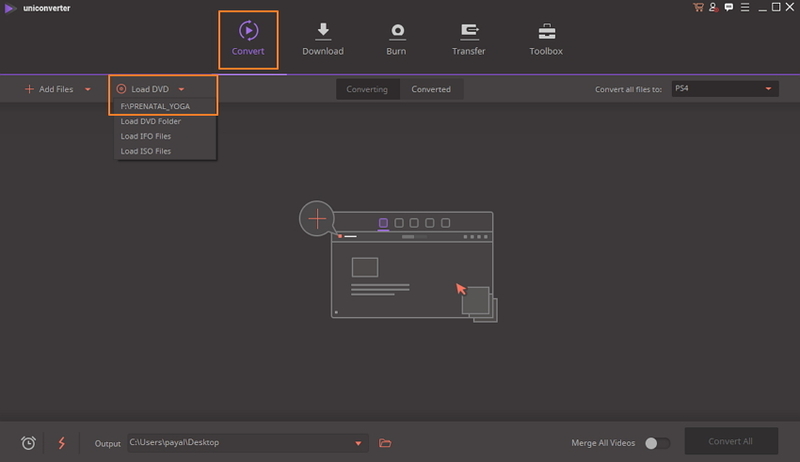 Open Wondershare UniConverter (originally Wondershare Video Converter Ultimate) on your PC. From the primary interface, select the Convert tab, and open drop-down menu next to the Load DVD option. From the given options, select the title of the DVD disc that is inserted into the PC. A pop-up window will open to ask if you want to load only Main Movie or All Movies. Select the desired option and click OK. Step 2 Select Xbox One/360 compatible format. Once DVD disc files are loaded into the program interface, click the inverted triangle at Convert all files to: at the top-right corner. Next, choose Device > Games> Xbox One or Xbox 360 from the list. Step 3 Convert DVD to Xbox One/Xbox 360. At the Output option select the location on your PC where you want to save the converted files. As the final step, click Convert All to start the conversion process. Following the above steps will help you to convert all types of DVDs to Xbox format so that you can watch DVD on Xbox without any compatibility, region or disc issues. So when the query is - does Xbox 360 play DVDs, with respect to Wondershare, the answer is “Yes” and without any limitations. There are a number of Xbox gaming console models available. The bundled packages are also there for purchase which along with gaming console, and controllers also have game download, and other offers. To make your selection process a little easier, we have picked up some of the top selling models of the year. •	40% more power than other consoles. Enjoy playing on one of the most powerful device. •	Features 6 teraflops of graphical processing power that along with 4K Blu-ray player enhance gaming experience. •	Allows playing with the greatest community of players. •	This latest model is compatible with all devices, controllers, and games. •	Allows watching every frame with 326GB/sec of memory bandwidth. 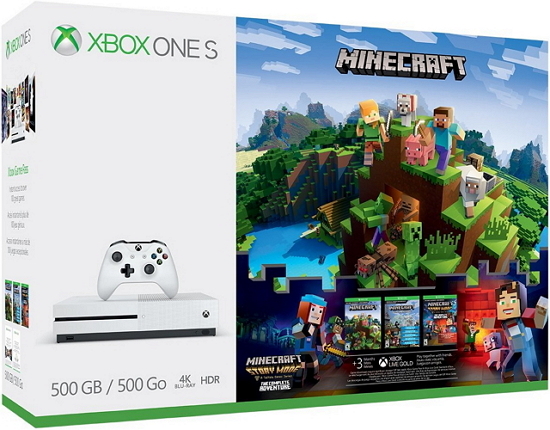 •	The gaming console allows you to play the Minecraft across all Windows 10, consoles, and mobile. 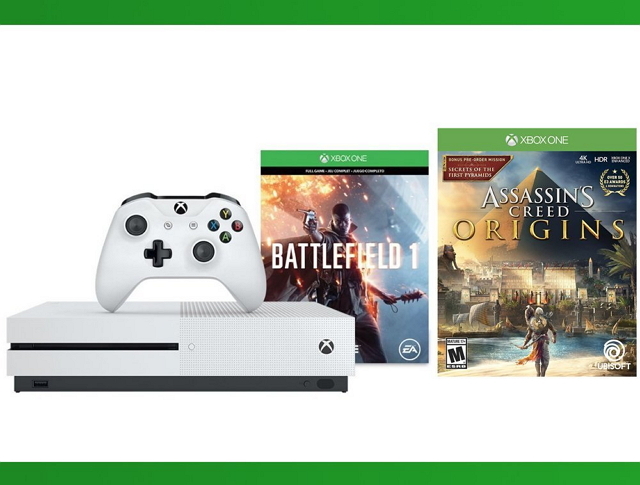 •	Comes with 3 months of Xbox Live Gold where you can play games with your friends online and also get access to free games and other offers. •	Console offers excellent graphics and High Dynamic Range. •	To enhance audio experience it comes with Premium Dolby Atmos and DTS:X Audio. 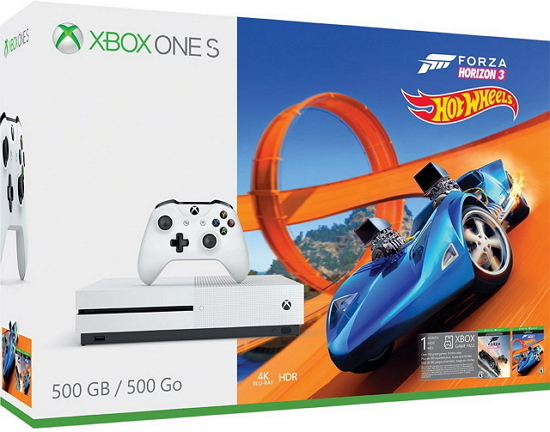 •	The Bundle pack comes packed with 500GB of gaming console, Hot Wheels expansion download, Xbox wireless controller, Forza Horizon 3 game download, 14days of Xbox Live Gold trial, and 4K capable HDMI cable. •	4K Ultra HD support for streaming videos and watching UHD Blu-Ray movies. •	Allows connecting, competing, and sharing platform with gamers on Windows 10 and Xbox One. •	Spatial Audio for enhanced experience. •	This starter bundle comes with 500GB of gaming console, Xbox wireless controller, and 3 months of Live and Games Pass Starter Bundle. •	Offers diverse range of game lineup. •	High Dynamic Range of the console offers crisp and bright video. 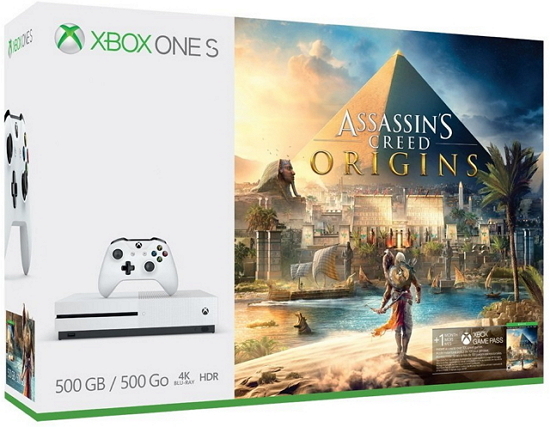 •	The pack contains 500GB gaming console, full downloaded Assassin’s Creed Origin’s game, and Xbox Controller. •	4K Ultra HD Blu-ray with 4K video streaming offers brilliant gaming experience. •	The pack offers access to more than 100 great games along with 1 month of Xbox Game Pass. •	Enjoy uncovering the pyramid mysteries, and lost tombs with exciting features of the game. 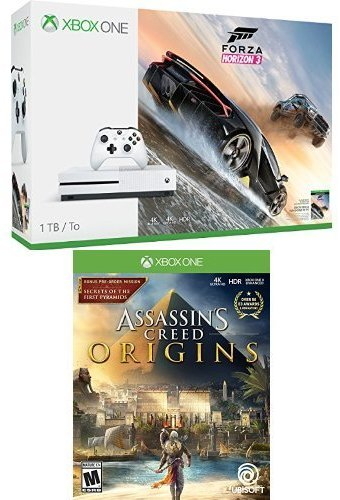 •	This bundle pack comes with 1TB Xbox One s console, Xbox wireless controller, HDMI 4K capable cable, complete downloaded game of Forza Horizon 3 for both the Windows 10PC, and Xbox One, and Assassin’s Creed Origins. •	Allows you watching 4K Blu-ray movies and also stream 4K content on Hulu and Netflix. •	The HDR technology enables you to enjoy richer and more luminous colors of the game. 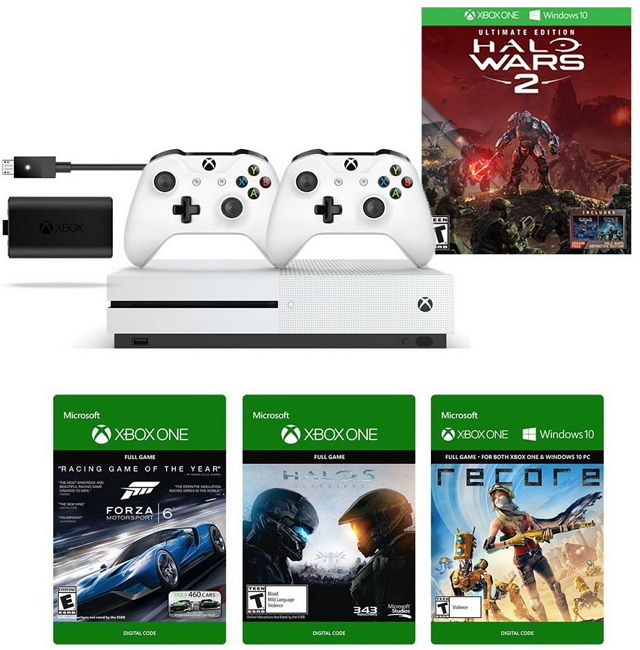 •	Bundle inclusions- 1TB gaming console, Halo Wars 2 Bundle, Play & Charge kit, additional Xbox White wireless controller, Code for Halo 5 digital game, code for Recore Digital game, and Forza Motorsports 6 digital game code. •	The precision controller with the bundle is compatible with Windows 10, Xbox One, and Xbox One S.
•	Controller features Bluetooth for gaming on tablets and Windows 10 PC. •	The play and charge kit is compatible with original Xbox One Wireless controller and new white Xbox wireless. Gets fully charged in less than 4 hours. 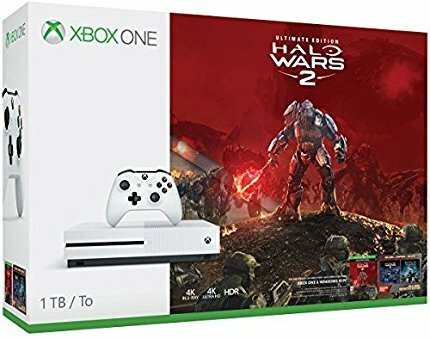 •	Includes 1TB Xbox One S gaming console, power cable, Xbox wireless controller, full game download of Halo Wars 2 standard edition for Windows 10 and Xbox One, HDMI cable, and Xbox Live 12 month of Gold membership. 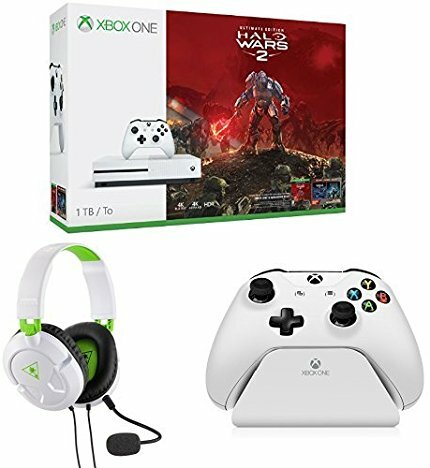 •	An ultimate pack for the gaming lovers including 1TB gaming console, Controller Gear White Controller Stand 2.0, Turtle Beach 50X White Stereo Gaming headset for Xbox One, HDMI cable, power cable, complete game download of Halo Wars 2: Ultimate Edition and Halo Wars: Definitive Edition, Halo Wars 2: Season Pass. •	The gaming headset of the bundle is comfortable and lightweight. The device features crystal clear chat with high quality 40mm speakers. •	The headset works perfect with the new Xbox One controller, PS, Mac, tablets and other devices. •	The Controller Stand v2.0 is facilitates converting the 2 handed controller into 1 handed remote. How to watch a DVD on Xbox one ? You know the methods now. The Blu-ray player app will come with restrictions to the region while Wondershare software offers complete solution without any limitations and with best quality output.